I know, some folks will say it’s not a holiday, but actually it is. Or it was originally, back when it was called All Hallows’ Eve. That was the night before All Saints Day, the holiest day of the year, and it was the last hurrah for the evil critters who worked for the Devil, before all the saints rose up and drove them back to Hell. So, if not a holiday, exactly, perhaps we should call it a helliday. And dressing up as someone we’re not, eating lots of stuff that’s bad for us, surely we can have a hella time. 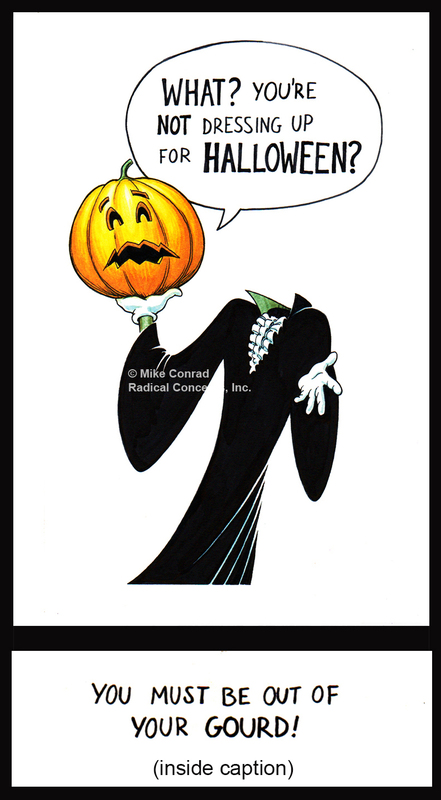 Several years ago, I happened to be in a store about this time of year, and as I wandered down the greeting card aisle, I noticed that the only Halloween cards on the rack were for little kids. Lots of cute bats and marshmallowy ghosts, but nothing that an adult could stomach sending to another adult. The Ghostess with the Mostest was everywhere in spirit, making her presence known in all manner of imagery, be it an animated painting or a statuesque sculpture, always trying to break the tension with snarky comments and devilish word-play. A secret passageway led to Elvira’s Boudoir for a semi-lewd interlude of revealing comments by way of the lady’s magic mirror before the frightful journey resumed. 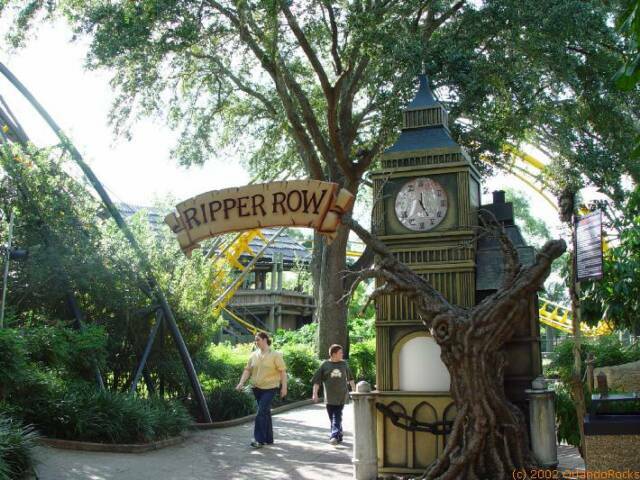 There were also Ripper Row, a walk through 1800s London at the mercy of Jack the Ripper (in Nairobi); Bloody Bayou, a romp through the swamp where the malevolent Bayou Clan worked to trap visitors in gratuitously graphic scenes from classic horror films (Bird Gardens Pavilion); and Demented Dimensions, with its vibrant 3-D imagery of hidden worlds uncovered by a hapless archaeological expedition. (Akbar’s Adventure Tours). In the spaces between these venues we set up a number of Scare Zones. There were Grisly Gardens (Congo), a botanical garden gone wild, with plants and statuary that came to terrifying life; Agony Express (Nairobi Train Station), where passengers too scared to board the train and be menaced by the possessed passengers would end up being chased by those inhabiting the station itself; Cursed (Timbuktu), home of a heartless queen and her evil entourage who lived to condemn the unwary guests to a gauntlet of mortifying hexes; and X-ecutioners (Bird Gardens), a neighborhood beset by murderous gangs of skating hoodlums out to protect their turf at all costs. 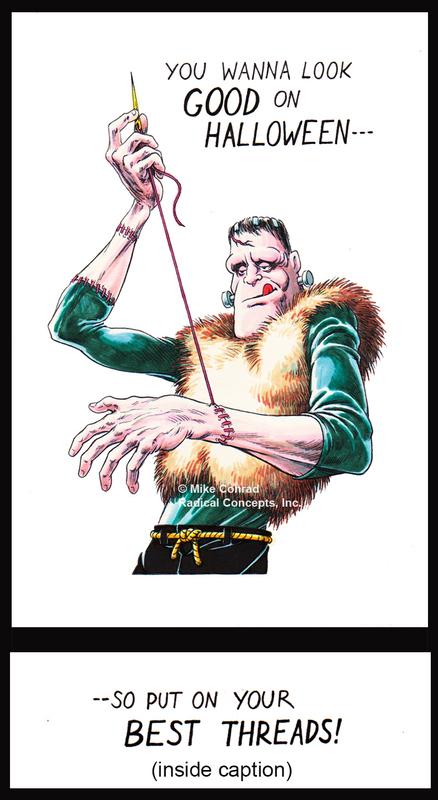 There were also a couple of live shows, namely Rip TV 2 (in Das Festhaus), a variety show with too much gore for prime time, and Fiends (at the Stanleyville Theater), in which Dr. Freakenstein and his twisted nurses are bent on breathing life into Frankenstein’s monster. 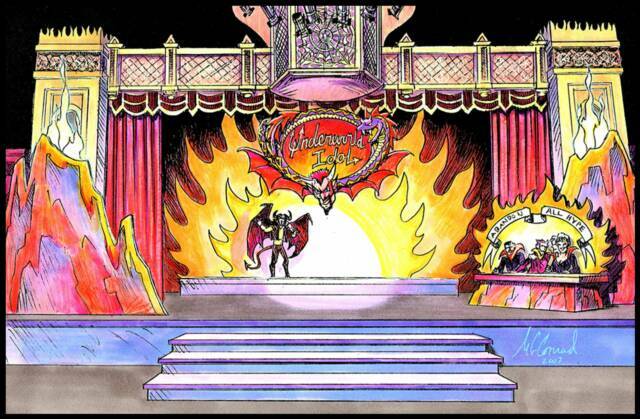 The initial concept for the TV show was Underworld Idol, a devilish parody of a televised talent show, and I drew up some concepts for the stage set and logo. But the decision was made to simply re-boot the prior year’s show, and Rip TV 2 was the result. I regret that I did not take photos of all the finished venues, or even keep copies of all the drawings. One of the more memorable pieces included a Haunted Playground in Ripper Row, with a Victorian-era wooden swing set and merry-go-round that moved as if by invisible hands while the faint laughter of ghost children wafted through the area. 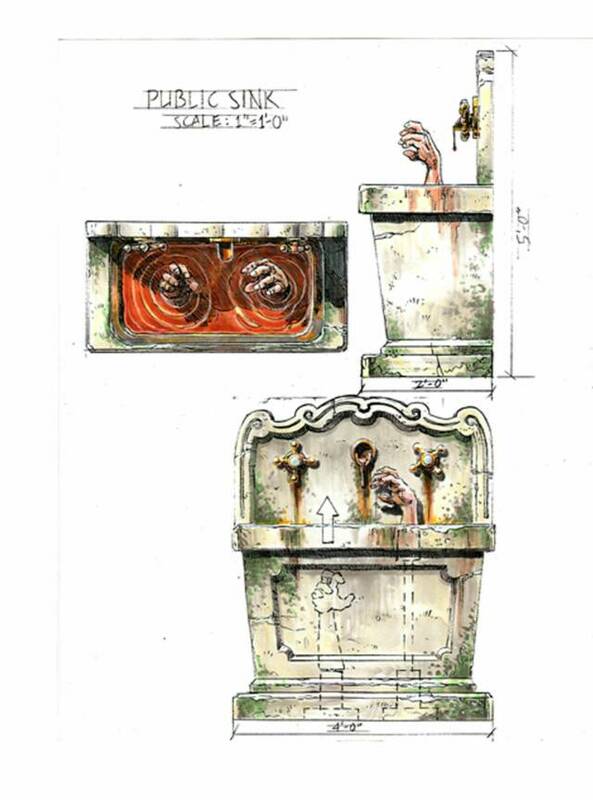 There was also a public sink with rusty pipes dripping a red liquid into the marble basin. Looking closer, one might discern that the fluid was more like blood – a point driven home when a pair of human hands suddenly lunged up out of the depths. In a dark alley further on, an oxcart loaded with animal hides looked like an ideal place for a bad guy to, well, hide. But it was a decoy; Mister Hide was really huddling in a heap of ragged clothes in the opposite corner, ready to turn and reach for an unwary victim when the moment was right. 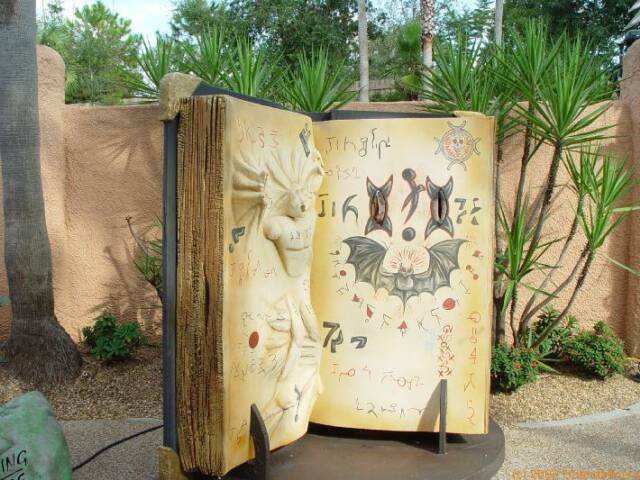 A favorite from Cursed was the giant Book of Spells. 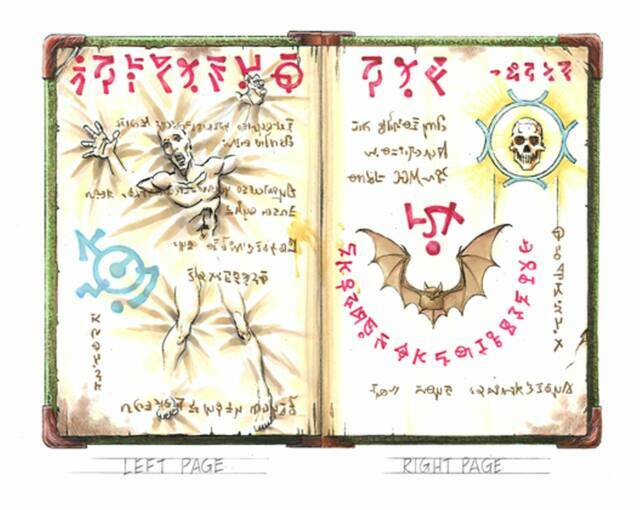 This eldritch spelling primer had enough volume to hold a full-sized human soul trapped within its runic pages. 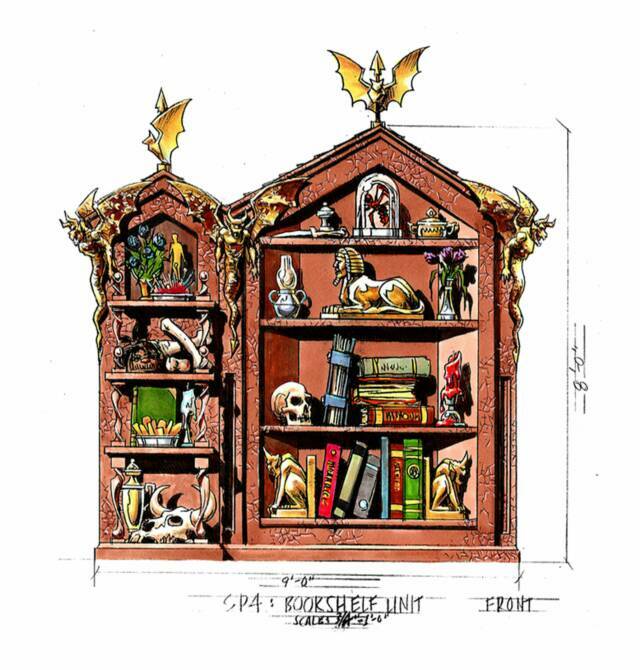 Nearby was a bookshelf chock full of mystical objects, witchy tomes and all the accessories a master of the dark arts might need, including a hidden door through which he might slip unseen from one world to the next. Or jump out and scare the guests, more likely. Everything was humming along nicely, sets were being constructed on schedule, and I was cruising through the installation phase when suddenly an additional requirement fell into my lap. There were to be dance parties spotted in cul-de-sacs around the park, each of which needing a DJ booth on a set of risers, with a small proscenium surrounding the turntable. These would be decorated with fluorescent paint in an appropriately eerie theme. The quickest way to accomplish this on such short notice was for me to just cut the pieces out of plywood and paint them in my studio, then drive the parts to Tampa and assemble them on site. Though not much to look at in daylight, they really popped at night, with strobes and black lights bringing the graphics out from their black backgrounds. 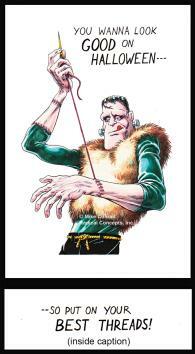 I am proud to say that the event was a monstrous success. Not only was I pleased with how everything looked, but other people seemed to like it, too. 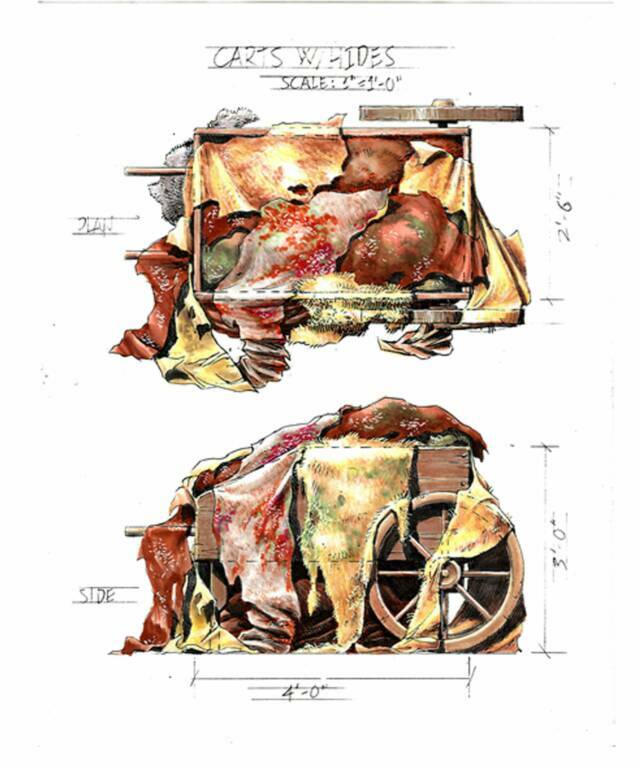 That year Howl-O-Scream was applauded by a national reviewer as the best haunted attraction of 2002, an accolade so richly deserved by the terrific team of people whose hard work and creativity had brought this thing to life. Robbi LePre's team at Busch Gardens and Joe Mertz's gang were all creative, open-minded problem solvers, the kind of folks that are a dream to work with. It's weird how such nice people can pool their efforts to put together such a purposely nighrmarish event. Elvira bills herself as Mistress of the Dark, but she’s been known to catch a ray or two. I’m speaking of Larry Ray and his lovely wife Phyllis, owners of Ray Productions, Inc., a fabrication company serving the themed attraction industry in Central Florida. 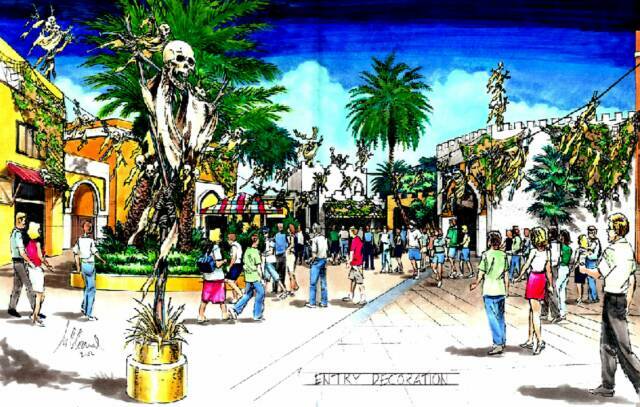 Previously, we had worked with Ray Productions on Busch Gardens Tampa’s Howl-O-Scream (see Past Project above), so when they landed the contract to bring Elvira’s vision of a franchise-worthy haunted attraction to life, we were brought in to consult on the project. This was the kind of job we really love to sink our teeth into. It promised the freedom to explore the nature of fear as entertainment, and seek to develop new ways to scare guests beyond the usual “jump out and wave a fake knife” trope that is the staple of so many such venues these days. Sure, we were going to use such startles to good effect, but we were charged up with the idea of finding other ways to get people’s hackles up, too. 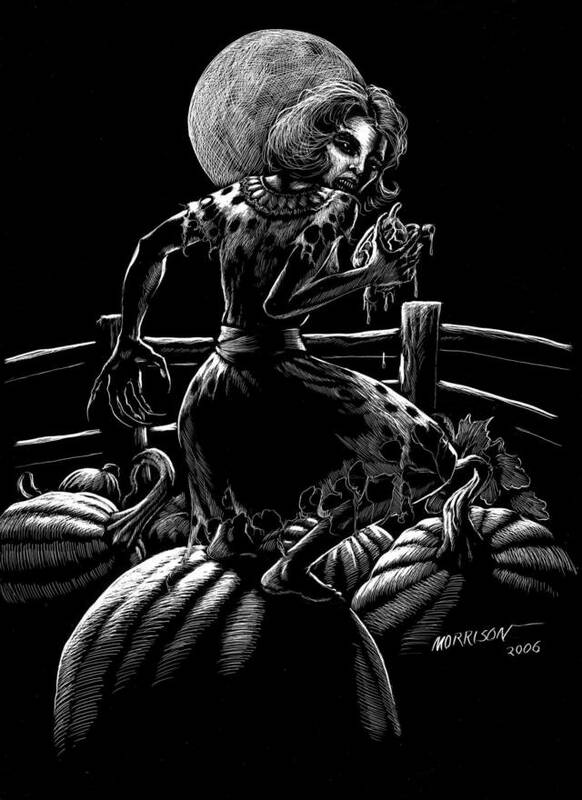 We were also asked to incorporate the pun-centric style of dark humor that Elvira is known for, and knew that this was right up our dark alley. For one thing, it would be a chance to try using laughs to help guests relax so they would be caught off guard when the scares happened. It wasn’t quite a blank slate, though. The Rays had relied on some other artists to dream up some of the ideas (and storyboards) that won them the contract, and we were required to build on that framework, adding to it and making it better wherever we could. 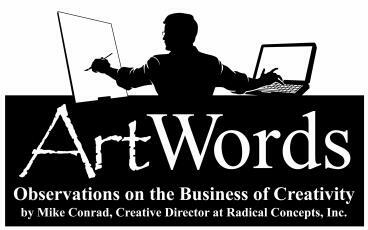 This was no problem for us – Radical Concepts is known as much for flexibility as it is for versatility – and so with a critical eye, we examined the work done so far and sought to improve only those parts that we felt really needed the work. And along the way, we saw opportunities for new additions that could enhance the experience overall. After brainstorming some of those ideas with Larry, we sat down at the computer and drafted a new Guest Experience, outlining the over-arching concept and laying out each room in succinct, but vivid, descriptions that detailed the decorative look and feel of each room and hallway as it would likely be perceived by one of the unfortunate guest victims. Every environment had its own spooky atmosphere, from the creepy playpen in the Cursory Nursery to the foggy cemetery of Graveland, to our favorite, the pulse-pounding (literally!) Hall of Blood. What is scary? As an occasional designer of haunted attractions who has worked on horror movies and written my share of creepy stories, I have given this question a considerable amount of thought. And although not everybody is frightened by the same things, there seems to me to be a common theme that underlies all the truly terrifying situations depicted in our popular culture. As I see it, the cold, clammy foundation of our greatest fears is the idea of being at the mercy of the merciless. bit older than the typical “treats and sweets” kiddie cards out at the time. I wanted to sell the line to Hallmark, so I sent off for their submission guidelines. When I read their little booklet, I realized that they do not have the freelance artist’s interests at heart. Basically, the message was, “We have a whole lot of professional writers and artists on staff, so whatever crude little attempts at card designs that you might present to us has already been thought of by our team.” Which meant that even if I sent them something completely original, they weren’t about to pay for it when their in-house guys could just come out with their own version and claim it had been in the works all along. So I passed. 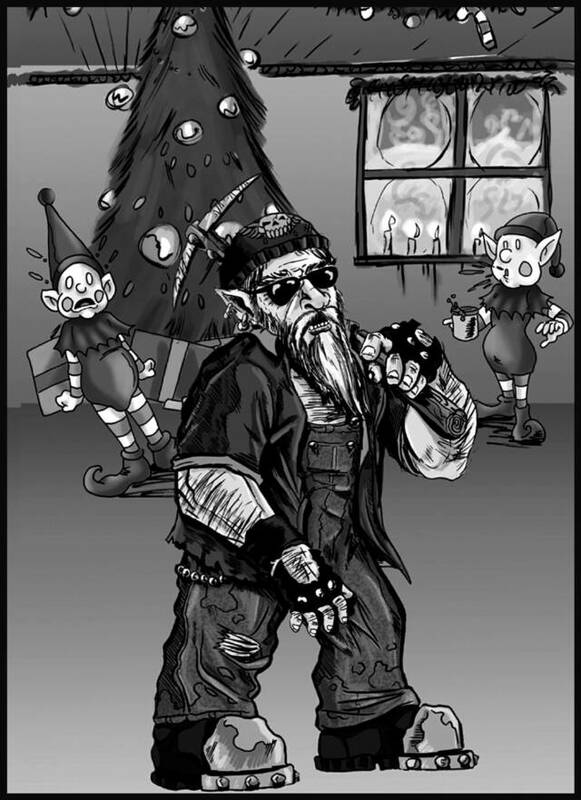 For the cover, I painted a gnarly, leafless tree in whose knobs and branches could be discerned abstractions of the characters from all the stories: three little pigs, a biker elf, a black widow spider, and so on. The dark forest is equally barren, apparently destroyed by the seepage of toxic waste from a nearby factory (you have to peer hard through the foggy background to see its smokestacks). The mutated tree has uprooted itself, lumbering through the glowing malignancy on claw-like feet. 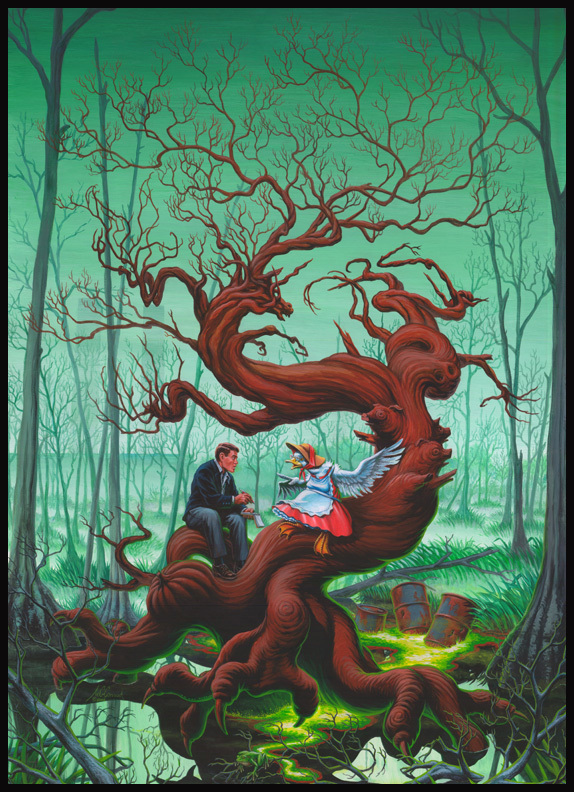 Riding on its twisty trunk is Mother Goose, relating one of her terrifying anecdotes to the rapt reporter, who seems blissfully unaware that his October perch is on the march. I have displayed this painting at several SF and Fantasy conventions, and it has won its share of prizes, including Second Place at DragonCon in Atlanta. The interior illustrations are also excellent, each providing a tantalizing taste of the story without spoiling any of the surprises. One thing that makes this particular volume unique is the inclusion of a CD of original theme music by a young composer who calls himself hypXoticus. It was a way to provide added value to the book at relatively little cost, although it’s not something the printer was ready to provide. We copied the disks ourselves, labels and all, and attached a sleeve to the inside back cover by hand. 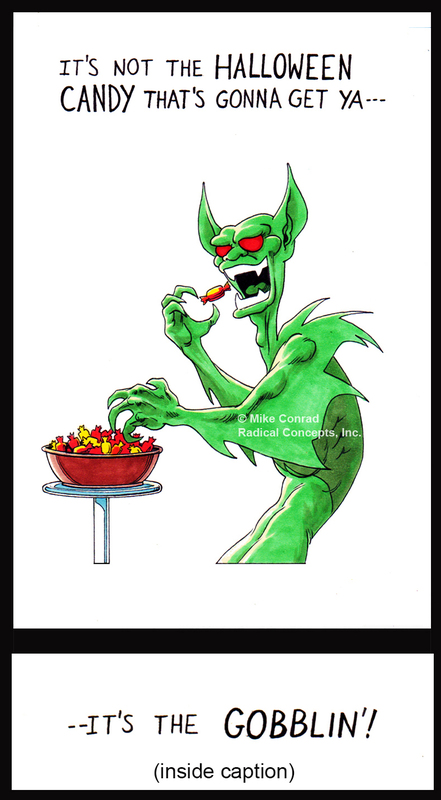 My favorite story, naturally, is the one I illustrated, which featured a wicked Tooth Fairy. So enamored was I of the idea, that I designed (and fabricated) a costume for Yvonne to wear to conventions, which garnered some fairly good publicity, especially when she won prizes in the masquerade. 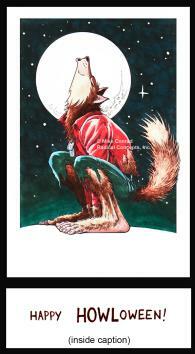 Roots of Evil and Other Stories is for sale at www.MikeConradArt.com, as are prints of the cover painting. 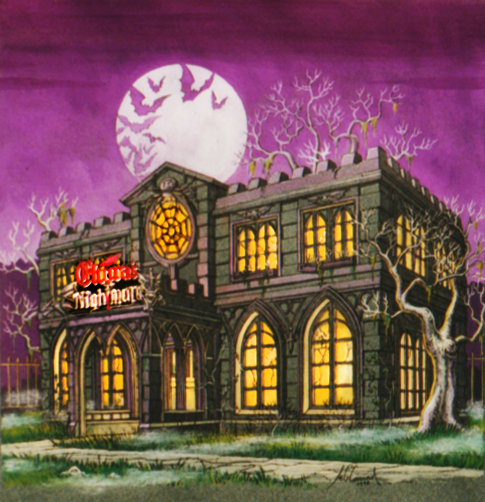 Concept painting of the more expansive, more expensive version of Elvira's Nightmare. 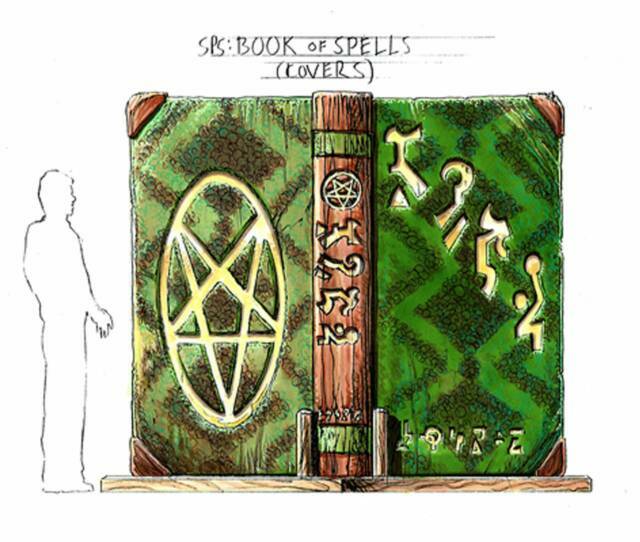 Concept painting of the smaller, crypt-inspired version. the original cards in a drawer and moved on to other projects. And then I moved, and moved again, and after several rounds of packing up and unpacking boxes, the cards got swallowed up in the morass and I couldn’t find them, even when I tried. Skip forward to a couple of weeks ago, when I was looking for art and photos for this Halloween-themed newsletter. I had hauled a few boxes of old project files and pictures out of storage, and was going through them in detail, knowing that at the very least I had good photographs of these cards somewhere. 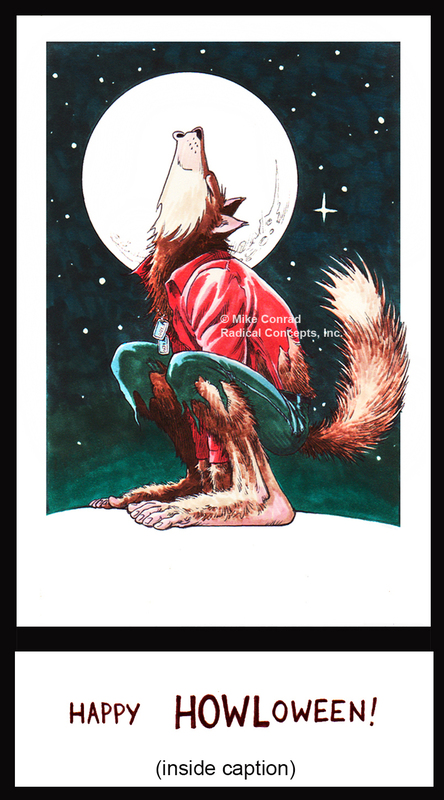 I managed to find them, and was busily scanning them in , trying to produce images of high enough quality that I could actually print out sellable cards, when I noticed another tub of files tucked under my drawing table. It was marked “Military” and was full of sketches and reference materials for my line of military posters. But nestled in among them was an even older folder containing, you guessed it, my original prototype Halloween cards! Grim as they are, these are not your brothers’ fairy tales. 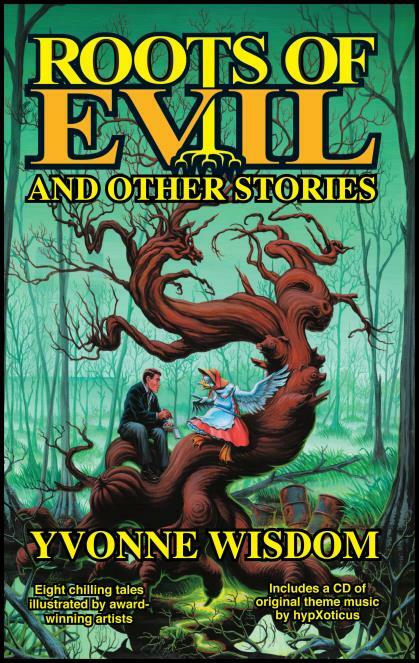 Yvonne Wisdom, a promising young writer with a girlish smile and a ghoulish imagination, conceived of Mother Goose as a withered old crone wary of the encroachment of modern civilization upon the enchantments of her beloved Dark Forest. But she is a wily one, and when a news reporter seeks her out for an exclusive interview, she is happy to oblige. What better way to convince the rest of the world to stay away? 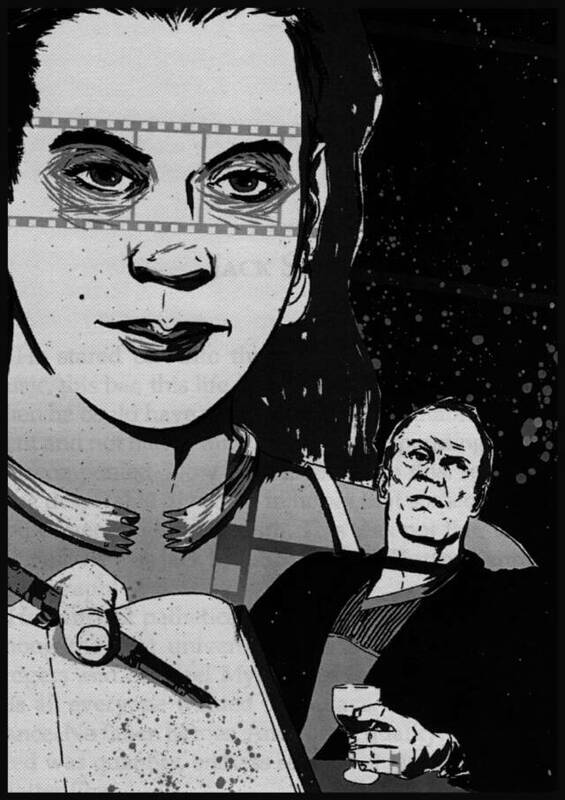 Roots of Evil and Other Stories was our second venture into independent publishing under the RC Press banner (the first being the comic book Peter Parsec, Space Cadet), and it was an educational experience, to say the least. After considerable research into the industry, and evaluating all the ways to get a book printed and marketed, we opted for RJ Communications (at SelfPublishing.com) one of the better-run on-demand and more reputable firms. We felt that we had the chops to design a professional-looking book on our own, and this seemed to be the only company that did not demand we use their in-house designers or choose one of their “proven” design templates. Still, there were plenty of hurdles to clear before this thing even got out the door. Some were purely administrative, like purchasing ISBN numbers and working out the budget, but the bulk of the work was on the creative side. 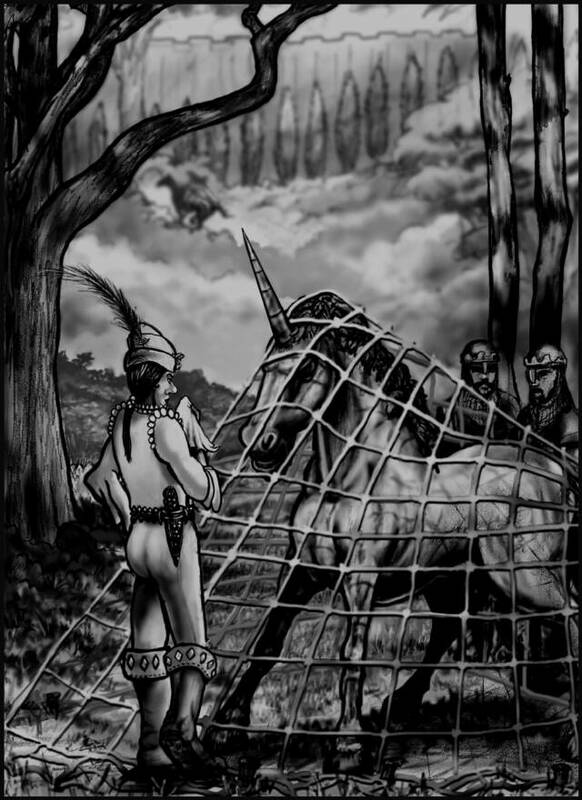 We signed up several illustrators we knew, mostly working in the fantasy and science fiction field, and gave them each a story to illustrate: one page, black and white. 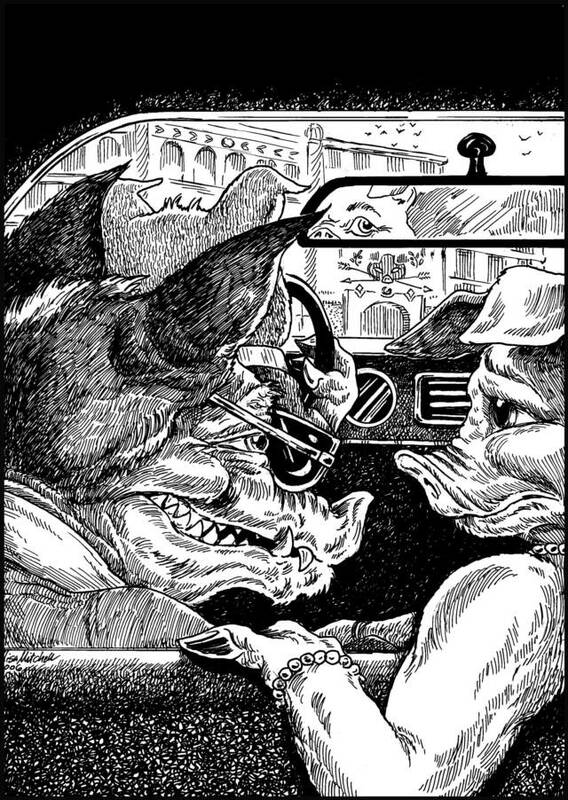 The Art Director tried to match each artist with a tale that would befit his or her particular style: artists with a somewhat cartoony bent were given the more whimsical tales, while the more serious chapters were assigned to those who liked to sling a darker shade of ink. The Editor went over the copy with a fang-toothed comb, correcting typos and grammar glitches, and making the occasional suggestion for a better flow of words. He wrote the introduction and the copy on the back cover, and sought reviewers to provide blurbs for the promotional materials. the back cover, and sought reviewers to provide blurbs for the promotional materials. A haunted theme park could be a scary proposition – if it were real. 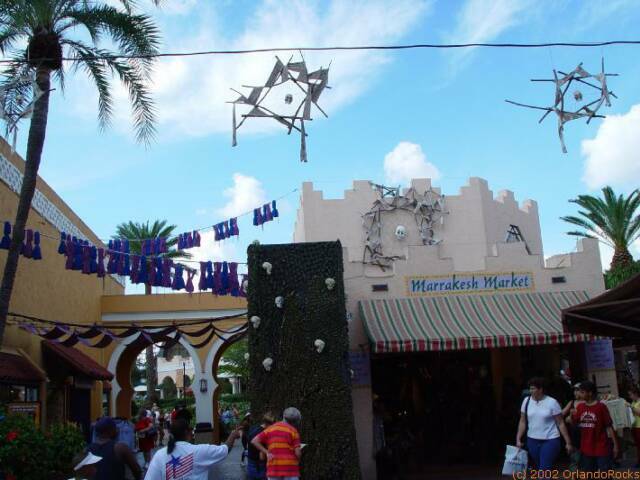 Imagine guests being pursued by the angry spirits of a tourist who had been run over by the monorail, or climbed out of the vehicle while the dark ride was in motion! 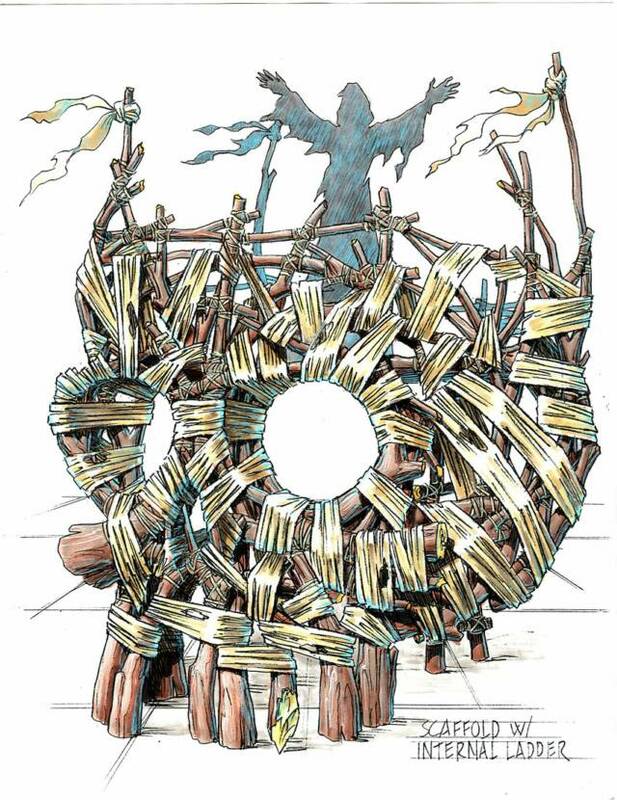 Concept drawing for the main entry area, showing Nightmare Catchers and voodoo-inspired "scarecrows" assembled from skulls, rags and scrap wood. can really give you the willies. Especially if the setting is done right, too. In a good haunted attraction, the set design is a character in and of itself, but because it can’t overcome its poor paintjob with superlative acting, it has to look good – well, evil – all by itself. Busch Gardens Tampa Bay got it right when they started dressing up for Howl-O-Scream back at the turn of the century. 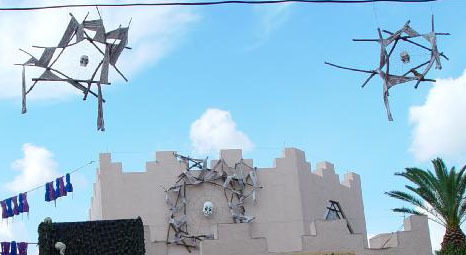 Joe Mertz Productions had the contract for 2002, and their original concept encompassed re-dressing regular attractions, such as the bumper cars, into horror-themed venues, the installation of stand-alone walk-through houses, and various scare zones in between. Each area had its own story to tell, and the challenge to the designers was to get some of that across with minimal exposition. The guests had to grasp the idea instantly, just as a vampire must grasp his victim before she has a chance to get away. Manuel Cordero was the Art Director in the starting line-up. 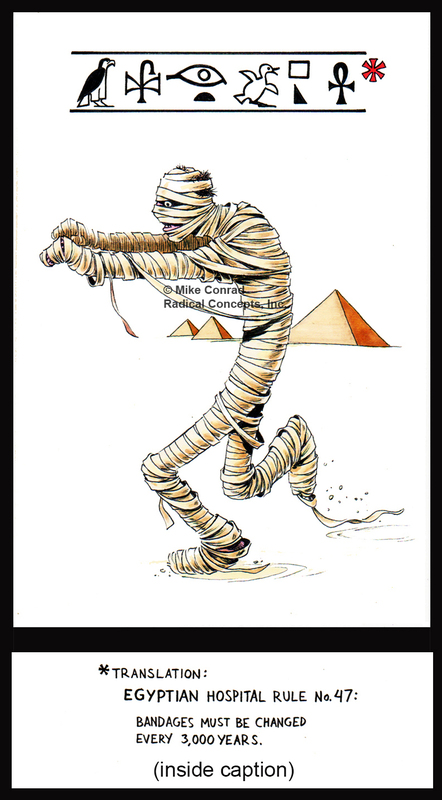 He applied his considerable talents to the task of maximizing the visual impact of each piece of the puzzle, sketching out the major icons and working with the Show Director to plot out the location of all the scares. Then he had to leave to work on another high-level project, and I was called in to fill his shoes. Taking over as Art Director where Manuel had left off, I sought to bring his ideas to completion, working out additional details where needed, and drawing up all the items that still needed to be visualized. On a project of this tremendous scale, that was still a lot of work, and I loved every minute of it. Some of the more successful ventures from the previous year were brought back, since tweaking them would be much more cost-effective than starting over from scratch. My job was to advance and enhance the creative vision of the team and ensure that all the sets and props maintained cohesiveness with that vision. 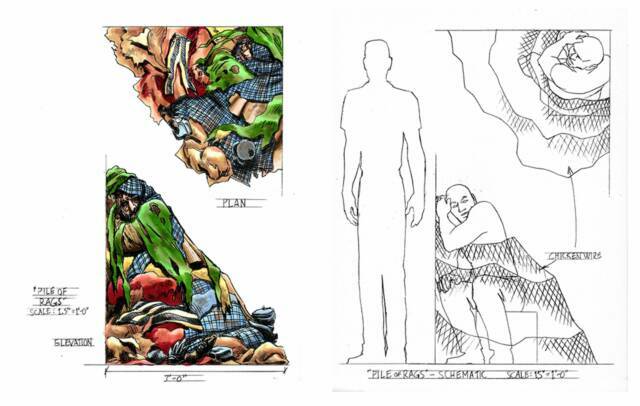 I produced conceptual drawings, usually in color, of the various facades and interiors, calling out important details and suggesting certain special effects. When necessary, I drew scale drawings to show how a certain gag might be accomplished, or how a piece of the set should look from various angles. The various houses were constructed or dressed out by a number of independent fabrication companies, most of whom required very little in the way of conceptual supervision. It’s always interesting to see how some vendors faithfully adhere to the original design while others cannot resist taking a more creative approach. Fortunately, their instincts are usually on the money, and what they come up with is often better than what we had in mind. I had some difficulty, however, convincing one fabricator that the broken-out pieces of the arched window in the façade were supposed to suggest the eye sockets and nasal cavity of a skull, and not just random damage. One of the trickiest requirements was to devise ways in which the nighttime festivities would not encroach too much on the daytime theme park experience. Some items were made to be wheeled backstage, others simply turned around to face the other way. Sometimes the best we could do was block off certain areas or cover the HOS elements with swaths of fabric. 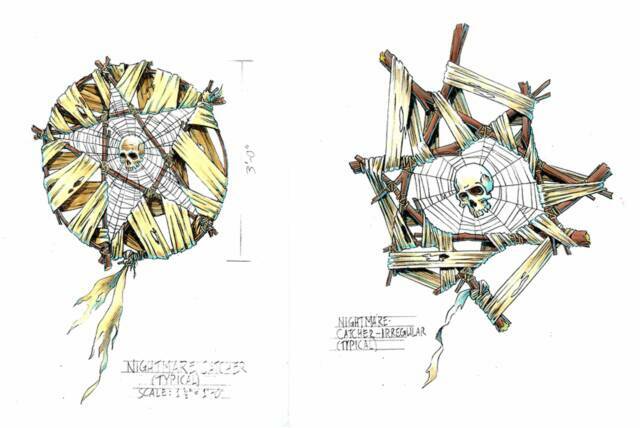 To grab the eyes of guests as they entered the park, I came up with Nightmare Catchers – rough wreaths of scrap lumber with giant spider webs as netting and a human skull at the center – that were to be hung on cables. During the day, they would be lowered to the rooftops or behind parts of the building facades, then raised into position at night by simply pulling the cables taut. I designed other scrap-wood voodoo decorations to match these, among them standalone scarecrows and a scaffold that the main icon character could use as a stage. The theme for 2002 was Face Your Fear. Haunted houses included Escape from Insanity, a mental hospital that was in serious violation of local health ordinances, (at the Crown Colony Skyride Station); Tortured, a Halloween party gone way wrong (in the Ubanga Banga Bumper Cars); and The Mortuary, inspired by the recent story of a funeral home in Georgia where the bodies were neither buried nor cremated, but simply stacked in the basement or dumped in nearby ditches – in this case, the dead were pretty unhappy about their treatment, and were wont to claw their way out of the blood-red clay to take their revenge on the living (in the employee parking lot). Nightmares don't faze Elvira; she's not on that couch for therapy. Ahead lay the All Pain, No Gain workout dungeon, the Alchemist’s Alcove and other memorable chambers, each weirder than the last, until finally the crescendo of fear reached its climax and the survivors escaped -- only to find themselves facing the mercantile horrors of the Creepsakes gift shop! We produced storyboards of some of these key scenes, seeking to present our vision for each room’s particular look, but they seem to have gotten buried underneath other projects’ artwork, and there doesn’t seem to be anyone brave enough to dig them up. Looking at the color renderings of the exterior design may give you some idea how the insides were supposed to look. We were asked to produce two versions, one for a high-cost façade and one for more modest budgets. The high-end style captured the aging majesty of an old Victorian home, with its high turret and a dragon-shaped weather vane, while at the other end of the monetary spectrum was made to resemble a family crypt, squat and squarish and seemingly built of white marble. Both featured gothic arched windows with a distinctive shape to the mullions that was meant to suggest a couple of Elvira’s most memorable features. Of course, there were also carved spider webs and other decorative touches, including a creepy landscape filled with spectral trees and surrounded by a wrought-iron fence. 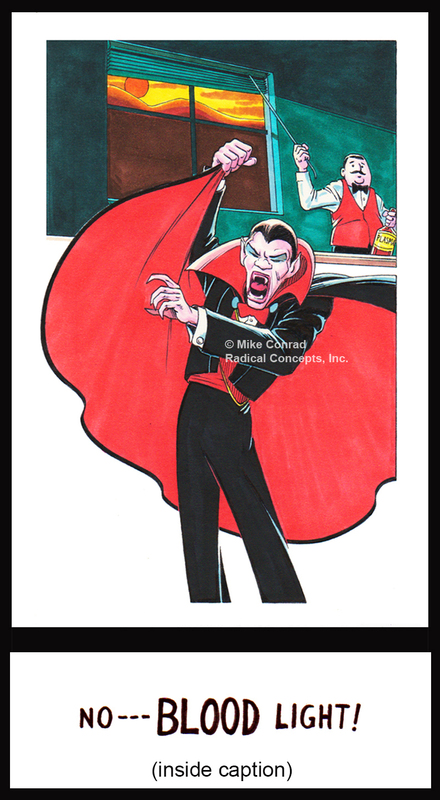 I caught up with the Mistress of the Dark at IAAPA, where she was making a costumed appearance to promote her similarly named simulator ride, and she graciously autographed the concept art in my portfolio. 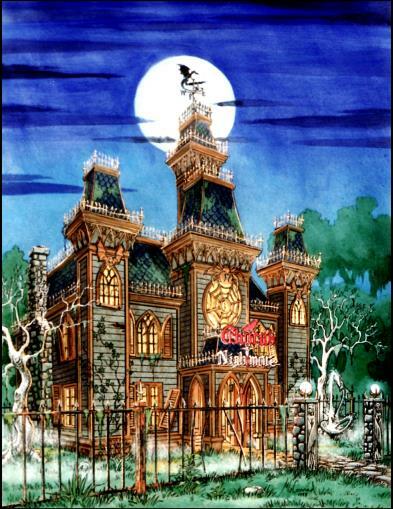 Elvira’s Nightmare Haunted House was marketed as a franchise opportunity, adaptable to just about any locale. Apparently, there were some takers, but as far as we can tell, they followed a different script. Some of them are still alive and kicking. Well, kicking, anyway. And at least we are there in spirit. Not wanting to go through the trouble of self-publishing (which was a lot tougher and cost-prohibitive back before computers and the internet had really hit their stride), I stuck . 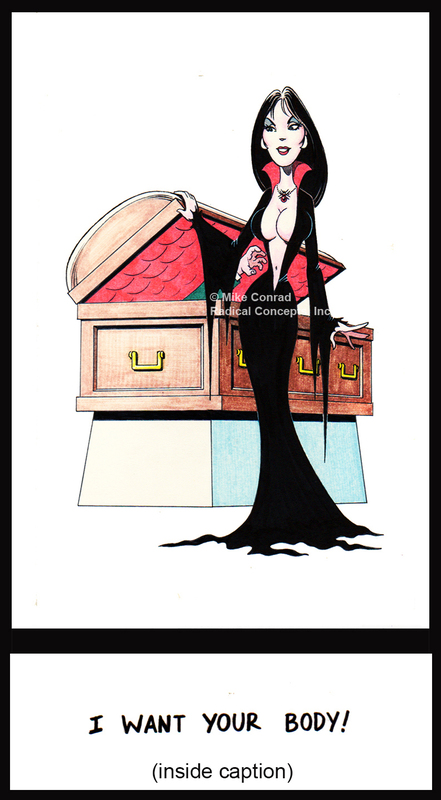 your body” could be what the Elvira-esque vamp is thinking as she raises the coffin lid, or it could be what’s on the mind of the corpse inside, who seems to be animate enough to be reaching for said vamp. torch or an arc welder or a sunlamp, only to respond, “No, a Bud Light!” The vampire, of course, prefers a different beverage, but he’s still a bit put out when the bartender opens the shades to reveal the rising sun. 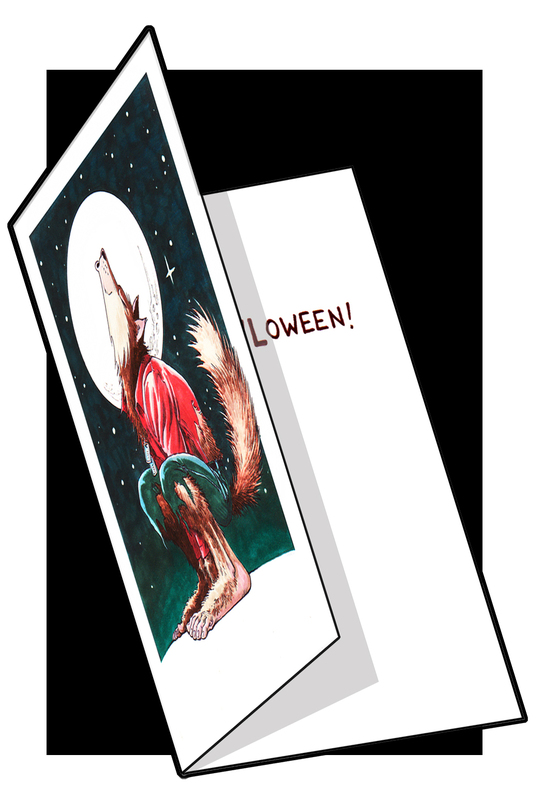 Nowadays, adult Halloween cards are fairly common-place. But I think there's room for more. 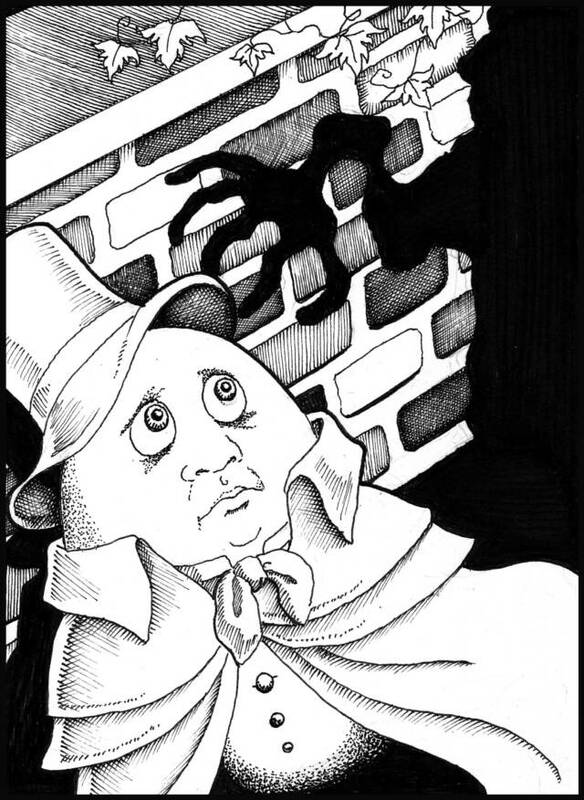 And so I am seriously considering doing an additional set, featuring such monstrous characters as a blob, a zombie, a witch, and whatever else I haven’t done yet – maybe even a second vampire, if a good enough joke comes to mind. And then I might even take a stab at other holidays and excuses to send people pieces of cardboard through the mail, like Valentine’s Day and Graduation. 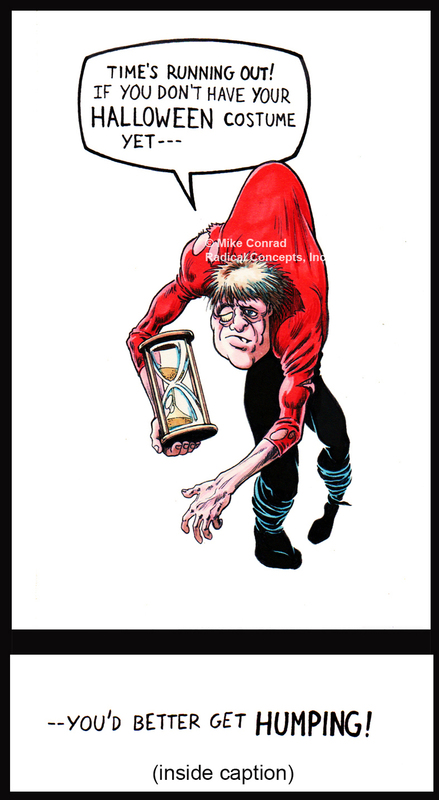 I’m selling these under the CardHouse brand, available exclusively through my website, www.MikeConradArt.com. 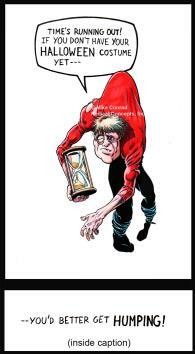 Check ‘em out, and share some gallows humor with a few of your friends. Greetings from our house to yours.